taken private a decade later by TPG and Silver Lake. Sabre’s market cap at the end of this first week of trading was $4.04b. Absent the news about their expectations for the IPO, this may sound great. That is until you remember that in 2006, TPG and Silverlake bought the company for approximately $4.3 billion in cash, plus the assumption of $550 million in debt. This now begs the questions, “Is this result ominous for the GDS industry as a whole?”. So back to the discussion of whether Sabre’s valuation is ominous for the industry. If we were looking at the industry based on Sabre’s IPO alone, it would indeed appear ominous and you would expect Amadeus’ results to be only marginally better than Sabre’s based on market share. But when characterized against rival Amadeus’ results, the story takes a much different tack. And there is nothing ominous in Amadeus’ stock performance, as portrayed in this chart on Bloomberg.com. In 2010, Amadeus raised $1.7b in its IPO (aka SPO), putting their market cap at the time at $6.82b USD. This was Amadeus’ second round on the IPO circuit as well, having been public in the early 2000s and then taken private by BC and Cinven in 2005 for $5.4 billion. Travelport is the only private company now, with Blackstone as their majority shareholder. 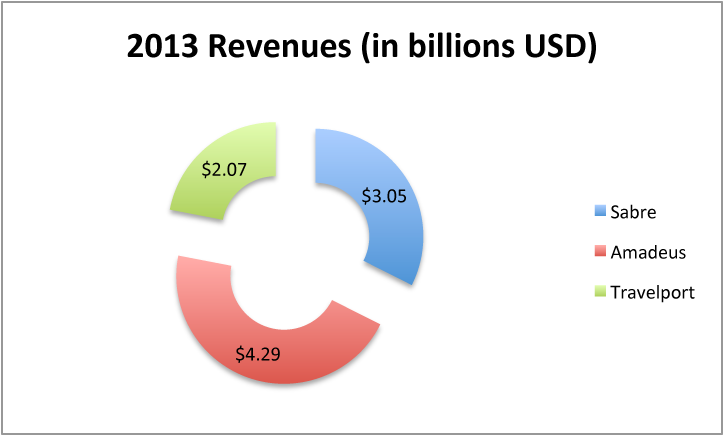 The company reports 2013 net revenue of more than $2.067 billion USD. This contrasts with Sabres $3.05 billion USD revenues for the same period and Amadeus’ $4.29 billion USD in revenues. So if you are on the small side of this pie, perhaps the Sabre IPO news is a tad ominous. But for Amadeus, they are strong and getting stronger. 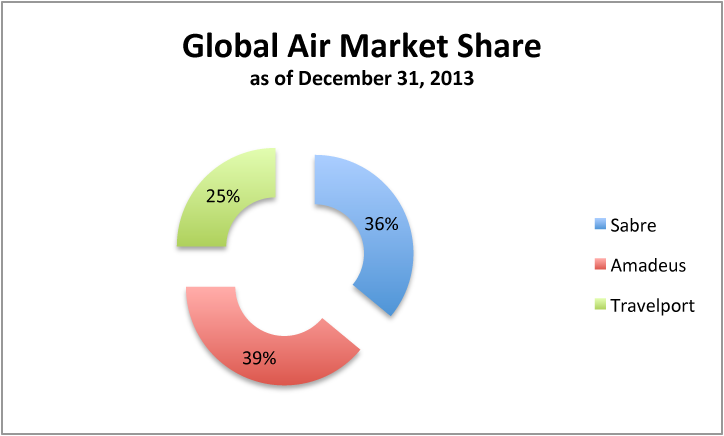 And Sabre and Travelport, I would say it is time for you to wake up and start serving the drive market. Maybe you’ll catch Amadeus asleep at the wheel. Or not.